My daily commute takes me south of Winnipeg into an area with several intensive hog operations. 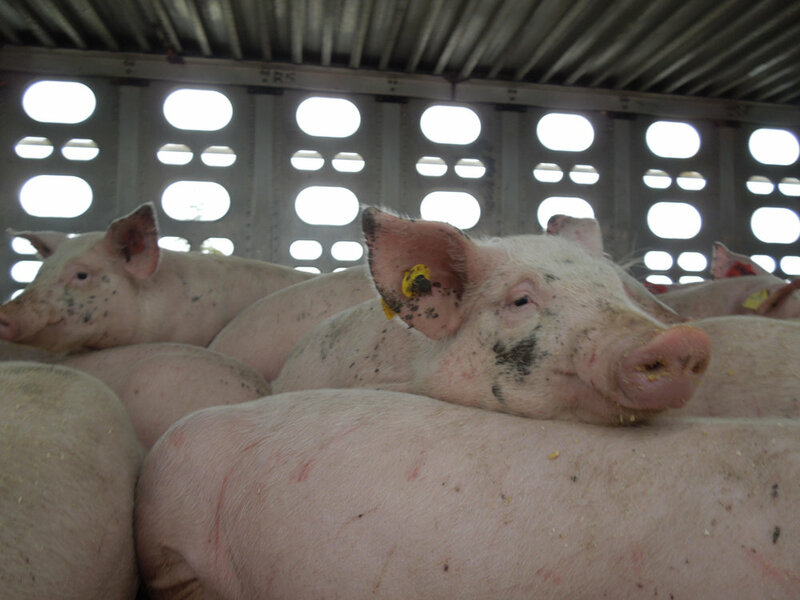 Manitoba produces somewhere around 8 million pigs a year, more than any other Canadian province, and each day, whether minus 30 C (-22 F) or plus 30 C (86 F), I pass one, two, three, four transport trucks carrying pigs to slaughter. I catch glimpses of them through air holes as I whiz by at 100 kilometers an hour, and they at the same speed in the opposite direction. Photo courtesy of Manitoba Animal Save. They’re cold or hot, tired, thirsty with no access to water, often crowded, and certainly distressed owing to the noise, wind and newness of the experience. Most have never seen sunlight until this day. I always react. Sighs. Muttered prayers (“May the Lord bless you and keep you ...”). Curses directed at industrial-scale cruelties. And a sense of utter helplessness to do anything about it. But during one grumpy commute, I remembered there are others making their way to Providence University College where we work and study also thinking about those distressed pigs. So began the Friendly Food Challenge. One day a week we urge employees and students to choose a meat-free meal or meals. It is a small gesture and those participating do so for a variety of reasons: health and weight loss; environmental concern; foodie curiosity (our supportive cafeteria staff offer up tasty vegetarian fare); a “team spirit” willingness to support campus initiatives; and for a number of students (bless them), animal compassion. By most measures, the scale of what we’re doing is inconsequential. Providence serves around 340 meals each Wednesday and since starting on November 1, 2017 (World Vegan Day), members of our community chose meat-free meals around 250 times. That won’t show up on any company’s ledger sheet, but no matter. It is instead a quiet, largely symbolic protest against cruelties inherent in factory farming. A handful of students at a little evangelical university on the prairies, surrounded by large livestock producers, bearing witness and saying this is not right, we refuse to participate. Many animal (and other) advocates know what it is to be overwhelmed. The problems are enormous, the suffering endless, the cruel Goliaths too big to take down. A “why bother” defeatism is a real risk as a kind of compassion fatigue sets in. But maybe we ought to measure success in smaller increments. If the ultimate prize is out of sight, beyond the horizon, any move toward it is good news. Calls to service do not always come with an assurance of success. Prophets are to speak though few listen to them (Jer 7:27; Ezek 2:5, 7), we’re to serve the poor even though poverty itself seems an undefeatable scourge (cf. Matt 26:11). There is mystery here. Willingness to take up a task, even if not wholly successful on the surface, matters. Unlike the story of David’s exploits, what constitutes victory is not always so obvious as a dead giant on the battlefield. Trucks still roll down the highway leading to our school, but it seems our students have accomplished something big. Confronting any form of systemic violence with only a few small stones in hand takes courage. Their willingness to do something acknowledging the pains and distresses of farm animals is indeed a victory worth celebrating. Michael Gilmour teaches English and biblical literature at Providence University College. His current research considers the convergence of animal welfare movements of the nineteenth century and animal-friendly creative writing. His most recent book is Animals in the Writings of C. S. Lewis.